With BSS Minimum Order Amount For Customer Group Extension, effectively set the minimum order amount per Customer as well as store view. Take control over the number order of customers at ease with Magento Minimum Order Amount for Customer Group by BSSCommerce. By using Magento Minimum Order Amount for Customer Group extension, admin can set up the requirement of number orders that customers need to meet this requirement to complete their purchasing process. With following key features, Magento Minimum Order Amount for Customer Group by BSSCommerce is valuable for you to have the most interesting experience ever. Why Magento Minimum Order Amount for Customer Group by BSSCommerce is your must-have extension? Designed to help Magento owners improve their revenue due to their right to set up a minimal sum of money with different customer categories: General Customer, Wholesale Customers, Retailers or Not-logged-in customers. That is a convenient and effective solution, essentially for B2B business models and wholesalers who want to raise sale performance as well as total revenue and improve the efficiency of online selling. Allow sending customizable messages to notice to each customer group. 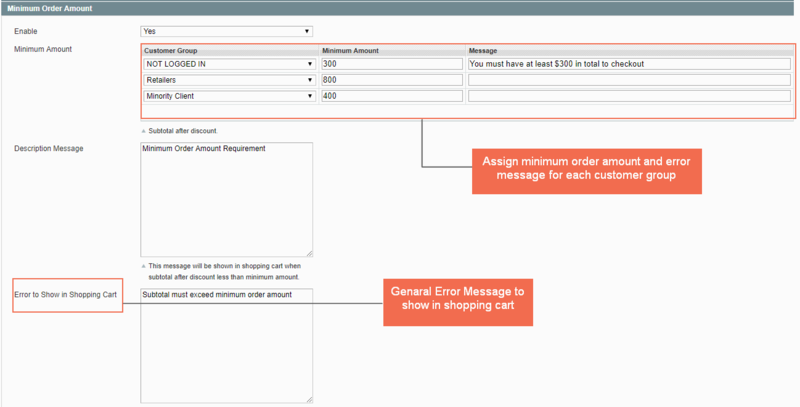 Magento Minimum Order Amount for Customer Group Extension by BSSCommerce allows admin to set their own messages to explain to customer the reason they cannot checkout. Therefore, shop onwers can flexibly express their own words to encourage customers shop more until the requirement is accepted. This extension is designed to allow the admin to add customer groups, set requirement for each group, enable/disable the module and configure message for customers. In general, the admin has right to configure the module to adapt his demand as much as possible. BSS Support team will provide you all of the best services until you feel pleasant from purchasing to the installation process. With the highest responsibility and professional skills, BSS team commits to support anytime you need helps. We also provide clear and detailed instructions for anyone who wishes to set up and configure the extension by themselves in our enclosed PDF files. We are all ready to answer every question from customers, even those who want to customize the extension as their requirements. "I was purchased this extension and installed completely. The extension working as described but it conflict with my existing ext. So I was open ticket to BSS to help to check and they response very promptly. I'm very happy with their support." This extension is the best solution for my problems, it helps me so much to increase my revenue. Thank you so much. The service is very good, free install and support team answer my questions immediately. The price also cheaper and the extension is easy to use. "I bought this extension from BSS and I must say this is an awesome extension. We can set minimum order amount per group of customer as we want. It's fully customizable. Once again thanks for a great support from BSS. " We had some difficulties with the installation and the setup, but BSS support was magnificent. They solved it all. I am really happy now with the Minimum Order Amount. Highly recommended. "We had some difficulties with the installation and the setup, but BSS support was magnificent. They solved it all. I am really happy now with the Minimum Order Amount. Highly recommended." This is very useful extension and it has a very friendly interface as well. "it's a must have extension if you gonna expand your business and everything goes into automatically being processed. Great help from support team ever!" This plugin works great. BSS also offers free installation. Very fast and professional service! They were very helpful and resolved my questions very quickly. I have no hesitation about recommending this company or their Magento modules. Very happy.